I'm so beyond wiped from this long weekend of skiing, about all I can do is sit. My legs are killing me, but luckily I never crashed hard enough on any body parts to warrant sitting impossible. Just walking. It was a blast though. We hit up Keystone (which is becoming our regular spot more and more) and Breckenridge. We never made it to any of the Ullr festivites, but lazing around in the hot tub, drinking beer and eating delicious food wasn't anything to give up for some chili. Besides, home cooked Snickerdoodle cookies and blondies always beat chili (thanks again for those Chloe and Bethany)! The skiing was awesome. The snow, sadly, has still not hit our mountains enough to call the snow "good", but there wasn't too much ice. Just the end of the day on Saturday and certain spots in the shade on Sunday. We all definitely left happy, but totally exhausted. Amazing weekend. So, with little energy and zero leg muscle strength, painting my nails seemed ideal. I had about a million ideas swirling in my head, so to finally put one down on paper, or rather, polish, was difficult. I'm pleased with the results. 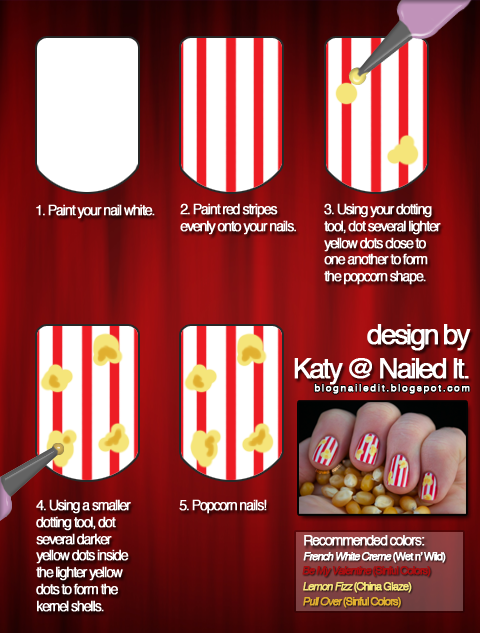 Here are my popcorn nails! Done using dotting tools, nail art brushes and patience, I used Wet n' Wild's French White Creme as the base. I striped the red lines on using Sinful Color's Be My Valentine (a nail art brush). Using my largest dot on my dotting tool, I randomly placed some circles of China Glaze's Lemon Fizz, then flipped that tool over to dot smaller Pull Over (Sinful Colors) dots on top of the larger ones. 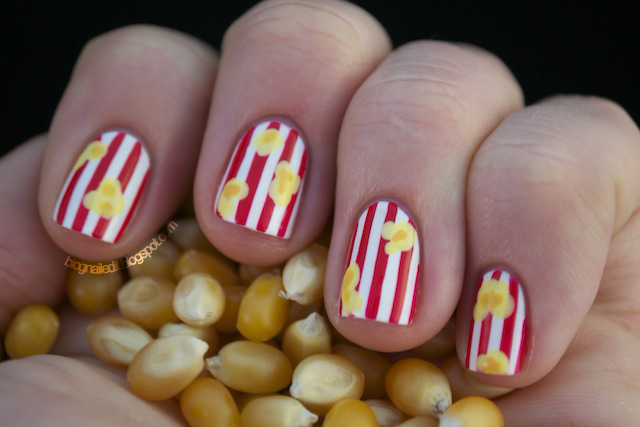 It was relatively easy, especially the popcorn kernels themselves. The only trying part of this manicure is creating straight red lines, and cleaning up the mess left afterward. I've been filling new follower requests recently, so I was in a Photoshop mood. The result is my first tutorial, inspired by Lacquerized's tutorial technique. Enjoy! Please do! Like I said, everything but the stripes is a cinch! Oh my gosh this is so cute! Definitely going to be giving it a try. That is soo cute, and I love your tutorial! This is beyond adorable :) And I completely love your tutorial. What an amazing way to show a tutorial! Aww! So cute! I love this design! You're welcome! I'd like to do more, so it's good to hear people are liking what I've done so far. Thank you, that's so sweet of you to say! Wow this is amazing! you've really outdone yourself here! I just love this! This is so simple yet effective. My favorite kind of nail art! This look is to die for! And so simple :) I should really try this some time. Thanks for sharing! These look great! 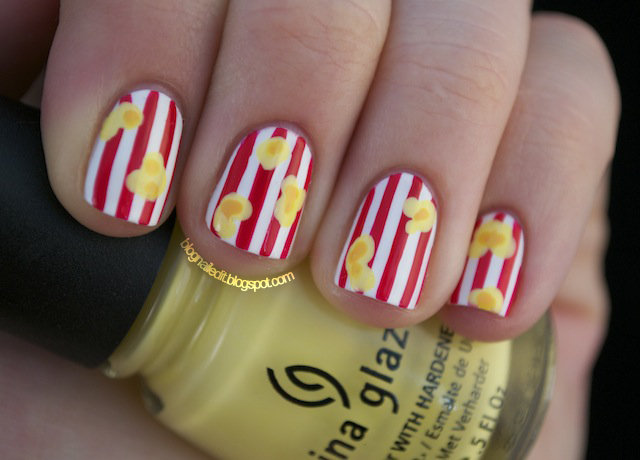 And they make me hungry for kettle corn, my fav kind of popcorn! omg this is so freakin adorable! i love it!